Buy 6 or more sets, and get Free shipping! We will refund your shipping charge. You can mix and match! 2019 Proof Set comes with a special W* mintmarked Proof Lincoln Cent! 5. River of No Return Wilderness, in Idaho. retirement, wedding, anniversary, or etc. This high quality, folder style birth set comes with five 2017-dated proof coins* from San Francisco Mint and included spaces for the baby's birth information(place, time... etc), and a built-in frame for photograph(3"x4"). Size: fold 6 1/4" x 7 1/2", unfold 6 1/4" x 15". *Cent, Nickel, Dime, Quarter, and Half Dollar. Celebrate your friend's, family's and team mate's birthday with this long lasting birthday card!! Your kids and their friends will love it, too. Stash some away for upcomeing birthday parties!! Cent, Nickel, Dime, 5 Quarters*, Half Dollar, Native American Dollar. *Pictured Rocks, Apostle Islands, Voyageurs, Cumberland Island, Block Island National Park. 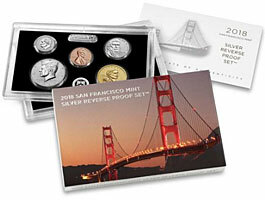 Special Reverse Proof Set to commemorate the 50th anniversary of the San Francisco Mint. Normally, proof coins have frosted image on mirrored background. Reverse proof coins have mirrored image on frosted background. The US Mint will issue new dollar coins from 2018 thru 2032, and this is the first coin of the serise, Signature of George Washington. Just one coin from San Francisco Mint in this package. 5. Block Island National Wildlife Refuge Quarter in Rhode Island. The Birthday Card that last forever! Ordinary birthday cards last just couple of days, or may be few weeks. After that the receiver throw them away. But not this card. This will last for long time because no one throw the coins away, especially proof coins. May be last for life time! *Effigy Mounds, Frederick Douglas, Ozark, Ellis Island, George Rogers Clark National Historic Park. There are No Presidential dollars in this set. 5. George Rogers Clark National Historical Park in Indiana. Great gift item for new born baby and the mom & dad! Cents, Nickel, Dime, 5 Park Quarters*, Half Dollar, Native American Dollar and 3 Presidential Dollars**. *Shawnee Na'l Forest, Cumberland Gap National Historic Park, Harpers Ferry National Historic Park, Theodore Roosevelt Na'l Park, Fort Moultrie National Monument. This high quality, folder style birth set comes with 2016-dated proof coins* from San Francisco Mint and included spaces for the day/time of the birth and length/weight of the baby, a built-in frame for photograph(3"x4") & a capsule for baby’s hair. Cents, Nickel, Dime, 5 Park Quarters*, Half Dollar, Native American Dollar and 4 Presidential Dollars**. Truman, Eisenhower, Kennedy & Johnson. 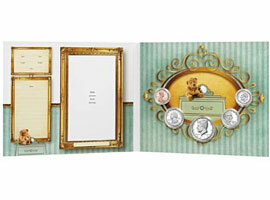 This high quality, folder style birth set comes with 2015-dated proof coins* from San Francisco Mint and included spaces for the day/time of the birth and length/weight of the baby, a built-in frame for photograph(3"x4") & a capsule for baby’s hair. *Great Smoky Mt, Shenandoah, Arches, Great Sand Dunes, and Everglades. 2014 National Park Quarters Proof set. Great Smoky Mountains, Shenandoah, Arches, Great Sand Dunes, Everglades. 2014 Presidential Dollars Proof Set. This high quality, folder style birth set comes with 2014-dated proof coins* from San Francisco and included spaces for the day/time of the birth and length/weight of the baby, a built-in frame for photograph(3"x4") & a capsule for baby’s hair. Size: fold 6 1/4" x 7 1/2", unfold 6 1/4" x 15". 2013 National Park Quarters Proof set. 2013 Presidential Dollars Proof Set. This high quality, folder style birth set comes with 2013-dated proof coins* from San Francisco and included spaces for the day/time of the birth and length/weight of the baby, a built-in frame for photograph(3"x4") & a capsule for baby’s hair. Size: fold 6 1/4" x 7 1/2", unfold 6 1/4" x 15". 2012 National Park Quarters Proof set. 2012 Presidential Dollars Proof Set. This high quality folder style birth set comes with 2012-dated proof coins* from San Francisco and included spaces for a welcome message and the day/time of the birth and length/weight of the baby, a built-in frame for photograph(3"x4") & a capsule for baby’s hair. 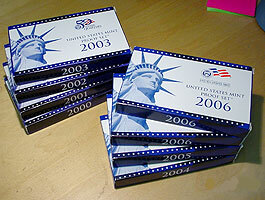 Size: fold 6 1/4" x 7 1/2", unfold 6 1/4" x 15"
2011 National Park Quarters Proof set. Gettysburg, Glacier, Olympic, Vicksburg, and Chickasaw. 2011 Presidential Dollars Proof Set. *Hot Springs, Yellowstone, Yosemite, Grand Canyon, Mt. Hood. 2010 National Park Quarters Proof set. 2010 Presidential Dollars Proof Set. Total 18 coins in one package. *Birthplace, Formative Years, Professional Years, & Presidential. 2009 Territorial Quarters only Proof Set. Washington D.C., Puerto Rico, Guam, Samoa, Virgin Islands and Mariana Islands. Birthplace, Formative, Professional, & Presidential. Come with original box and certificate. ** Washington, J Adams Jefferson, & Madison. Sample picture shown here is 1999 proof set. *Westward Journey Nickel: " Return"
Cent, Nickel*, Dime, Half dollar, and Sacagawea dollar. State quarters: CA, MN, OR, KS, WV. Cent, Nickel, Dime, and Half dollar. State quarters: DE, PA, NJ, GA, and CT. 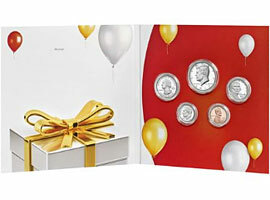 The US Mint has been issuing Silver(90%) Proof set since 1992. Among the 5 coins in the set, only 3 coins (Half dollar, Quarter, and Dime) have Silver contents. FYI: Few proof sets issued in 1990 came with cent without S mint mark, very rare. Proof coins were first sold around 1858, during the tenure of the 9th Director of the Mint, James R. Snowden. presentation to visiting dignitaries and national leaders. a continuous basis until 1964, when production was suspended because of a national coin shortage. Proof coin production was resumed in 1968 at the San Francisco Assay Office. each coin bears that "S" mint mark. highly polished dies to assure a mirror-like finish.